Fiskerton Airfield can be found between the villages of Reepham and Fiskerton, East of Lincoln and spanned the road which links the two villages. This road was closed for the duration of the war. Fiskerton was a standard Class ‘A’ airfield built for 5 Group. The airfield had the usual runway arrangement to standard dimensions. The technical site was to the south-east and contained two of the three hangars, one T2 and a B1; the other T2 was located off the northern perimeter track. Communal and accommodation sites were dispersed in fields and woodland to the south-east of the airfield and the bomb stores were to the north. Poor visibility caused by fog was a huge problem for aircraft returning from raids over Germany. 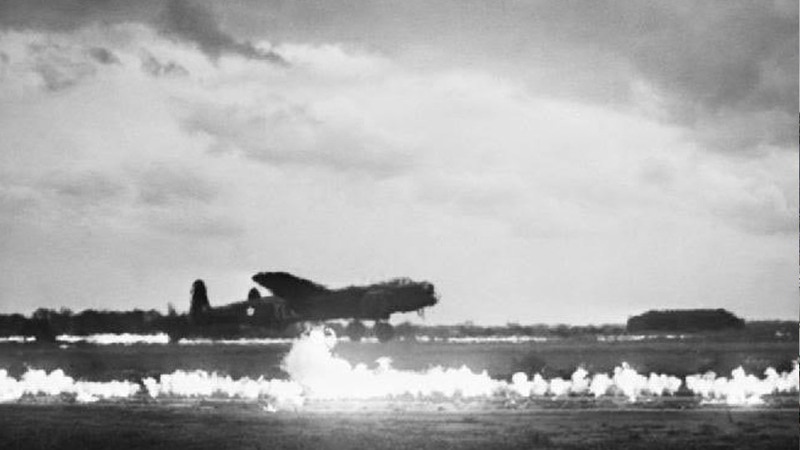 Fiskerton was one of four FIDO-equipped airfields in Lincolnshire – ‘Fog Investigation and Dispersal Operation’ was a system which dispersed fog from the airfield by burning fuel in rows on either side of the runway. The airfield opened November 1942, with 49 Squadron Lancasters arriving from Scampton on 2nd January 1943. The squadron departed for Fulbeck on 16 October 1944 and the station transferred to 1 Group. On 31 October 1944, 576 Squadron arrived from Elsham Wolds and remained until disbanded on 19 September 1945. In October 1944, 150 Squadron disbanded at Regina, Canada only to reform at Fiskerton on 1 November 1944. They remained until 22 November when they transferred to Hemswell. Also resident between January 1944 – January 45 were 1514 Beam Approach Training Flight’s Oxfords. The purpose of the unit was to teach pilots the art of instrument landings at night. After the war the road across the site reopened. 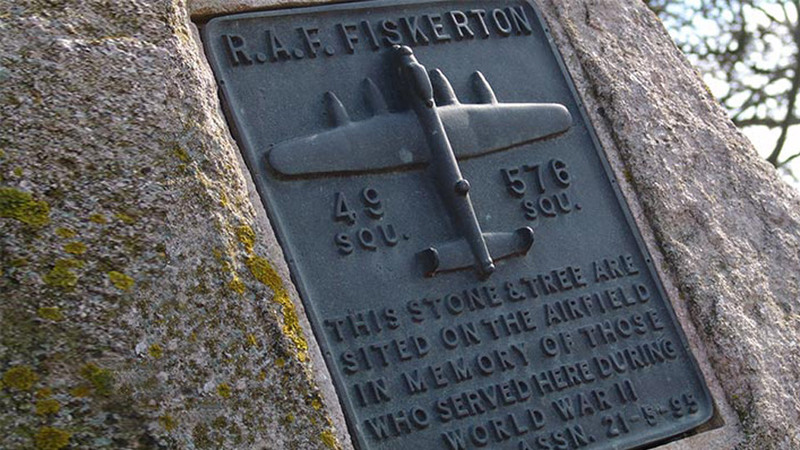 At the intersection of the runways where the road crosses, are memorials to ‘All who served’ erected by the RAF Fiskerton Association in 1995. Some buildings still exist to the east, notably the gymnasium and chancel but little else remains. 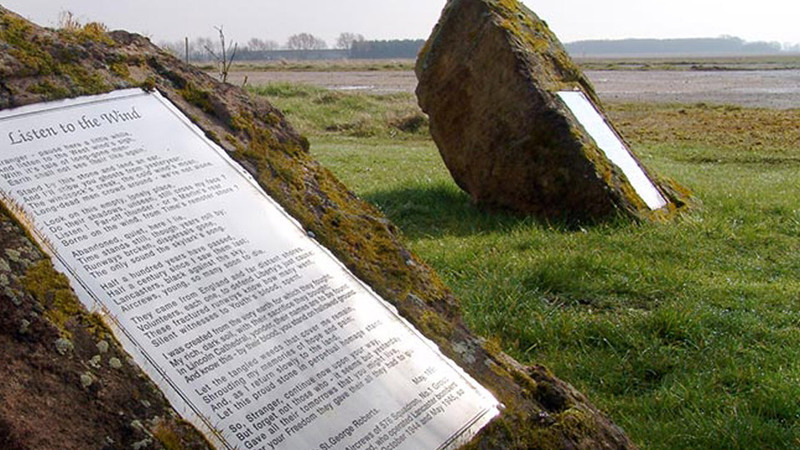 One of the memorial stones at Fiskerton bears the inscription of the poem ‘Listen to the wind’. Earth shall not see their like again. The only sound the skylark’s song. Aircrews, young, so many soon to die. Silent witness to youth’s blood spent. you stand on hallowed ground. they gave all they had to give. Cedrick Keith St George Roberts (1995). Dedicated to the Aircrews of 576 Squadron, No 1 Group, RAF Bomber Command, who operated from Fiskerton between October 1944 and May 1945, so many never to return.